It can be nerve-wracking the first time you venture out into the recesses of a four star restaurant with a new boyfriend in tow and the writers at AskMen.com have compiled a list to take your evening down a notch or two on the awkward list with their anti-romantic dinners. 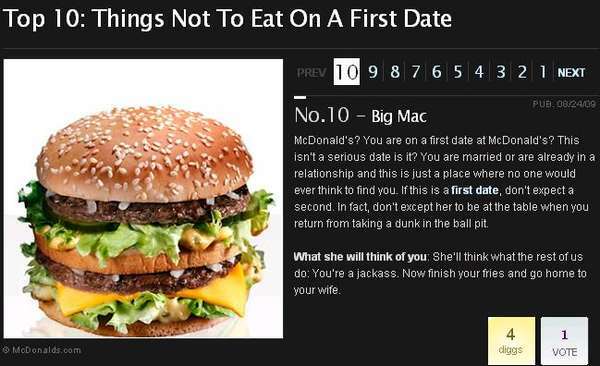 The anti-romantic dinners list includes such items as the Big Mac from McDonalds; not only is it messy, but you will come off looking cheap. Fish sticks, tacos and corn on the cob all made the list because, lets face it, there is nothing romantic about having corn stuck your teeth.